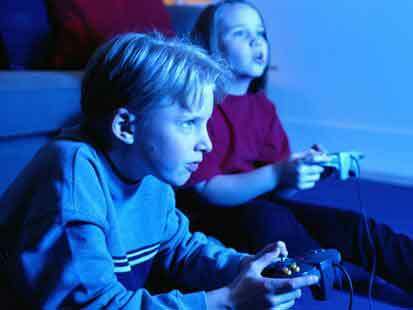 Is video game addiction corrupting our youth? The Wikipedia Free Encyclopedia reported that the American Academy of Pediatrics and the Council on Science and Public Health have indicated that any more than two hours per day spent playing video games should be considered “gaming overuse.” If we use that figure as a cut-off point, a youngster who plays up to the limit would be engaging in video game playing of fourteen hours per week. This means that nearly two working days a week would be used for gaming—a substantial amount of time indeed. And this would fall within the normal range! What about the many youngsters who exceed this number? And what about those young people who spend their other leisure hours glued to a cell-phone, watching television, or entertaining themselves by “surfing the net” on their personal lap tops or family computers? As one can see, a good deal of a modern child’s life can become devoted to “screen time,” which goes far beyond just playing video games. As noted earlier, one does not have to be a rocket scientist to recognize that this is not only a problem for our children but for those of us who are responsible for parenting and educating them. The attraction to electronic devises has become so pronounced that people intently focus upon them even while driving, walking, or attending social events. How often, for example, do we see children and adults alike chatting on a cell-phone, tending to an iPod, or texting while walking or driving on a busy street. They are so engaged in their electronically-charged activities that they are only marginally attending to what is going on around them. Obviously, this is a prescription for a disaster that could even lead to an accident or serious injury. Or how about the child or adolescent who is intently absorbed in playing a video or computer game to such an extent that he loses touch with reality around him? If you are a parent and insist that the youngster stop the game in order to attend to more important tasks this often leads to a “meltdown”. As a psychologist who works with families, I have found this to be a common problem for kids who are hooked on “gaming.” So much for the Fourth Commandment! The reality is that video games are designed to lure children, adolescents, and even adults into wanting to spend increasing amounts of time playing them. This is done by starting with simple tasks that can easily be mastered. The successful completion of these gives the player a sense of accomplishment. And it is this sense of accomplishment that evokes a compelling force within the child or adolescent, which encourages him or her to keep on playing. Like a one-armed bandit in a casino, the “small wins” are spaced just far enough apart to keep the youngster hooked into the game. Hence, the compelling interest in continued playing acquires an addictive potential. The attainment of a high score or meeting or beating the goals set by the designer are not the only lures used to hook gamers. Video games are designed to be exciting. This excitement raises the player’s pulse rate and stimulates the flow of adrenaline, even if the youngster is resting in a comfortable chair. No real physical effort or exercise is required to experience this “high.” And there are all kinds of exciting games that are designed to appeal to different personalities. Kids can elect to play alone or together; they can play reality-based games or explore the world of fantasy; or they can play intensely competitive games in which there is fighting, warfare, and other forms of pugilistic combat. In some games, the player is able to construct his own unique imaginary character that embarks on an exciting journey into a world of fantasy. Because this character is a creature of their own creation, players become emotionally attached to him or her. Moreover, the trials and tribulations encountered by their character while on this journey make it difficult to stop playing once the game is underway. The exploration of imaginary worlds and the anticipation and thrills of new discoveries and challenges can be a compelling force which, once triggered, cannot easily be overcome. Unlike the real world, in the world of video gaming the child has control of what happens. For some youngsters, this can give them a sense of power, especially if their real-life accomplishments are minimal. And then there is the lure of social relationships which are often attached to these games. Kids can play games with other kids online. For children whose social relationships are unsatisfactory, online gaming is an activity in which they may feel socially accepted and even admired for their skills. This alone is a powerful lure that keeps them hooked. Again, they may experience a sense of competency and power which seldom occurs in their day-to-day encounters at home, school, or in the community. Lastly, the content of video games is very often designed to attract and rouse the players’ sensual appetites (concupiscence), appealing to the lowest level of human nature. Games that contain foul language, violence, cruelty, warfare, sexual exploitation, and witchcraft can have a powerfully enticing attraction to naïve and curious youth, who tend to under-estimate the dangers of temptation, naturally gravitating to the “forbidden fruit”. Children and adolescents often allow concupiscence to dictate what is best for them. They will vigorously argue that the content of these games is “no big deal;” that their friends are allowed to play the games; and that they can ignore and not be influenced by the game’s corrupting characters, activities, or circumstances. However, this is the farthest thing from the truth. Unless their gaming is curbed by diligent parents, such flawed thinking can easily dominate right reasoning and the willingness to obey God’s Laws. Once this occurs, corruption is right around the corner. 1. Most of the child’s recreational time is spent on the computer or playing video games. 2. The child fails to complete or turn in homework and his grades are declining. 3. The child lies, downplays, or denies how much time is spent with the computer so that gaming privileges will not be taken away. 4. The child becomes irritable, depressed, short-tempered, or agitated when not on the computer or playing video games. 5. The child sneaks extra time, possibly late at night when parents are sleeping, to play video games. 6. The child becomes so involved with video games that he sometimes neglects eating, sleeping, and personal cleanliness. 7. The child experiences physical symptoms such as backaches, headaches, or dry eyes after playing video games. 8. The child develops a sedentary lifestyle, which could lead to excessive weight gain. 9. The child throws temper tantrums when told to stop, turn off the game, go to dinner, complete neglected chores, or get ready for bed. 10. The child is so preoccupied with gaming that he talks constantly about it, even when he is away from it. 11. The child may sincerely intend to play for only a short time on the computer. However, once engaged he is unable to stop, and plays for hours. 12. When ordered to stop playing video games, the child breaks into the computer, evades the password or stop-gap approaches. Anything to keep playing! In summation, a deteriorating emotional state and/or a failure to satisfactorily complete essential tasks are sure signs that “excessive gaming” is corrupting the child. But don’t expect children to understand or admit this once they become “hooked”. Rather, denial, arguments, and rationalizations (e.g. “my friends are all allowed to play. You’re overreacting.”) will be hurled at parents in an attempt to encourage them to question their judgment and to weaken their resolve. Like a junkie hooked on cocaine, the addicted child is only concerned with getting the next fix. The thought that gaming privileges might be restricted or taken away can lead to temper tantrums, defiance, and rage, which can be directed at parents or other family members. So what is the answer to coping with video games that may or may not be already in the household? If they have not been allowed into the home parents need to stay strong, continuing to say “NO” if the child asks for them. This will not be an easy task, particularly if the youngster associates with children who play these games and incessantly talk about them. The child who is denied access to gaming will be looked upon as being weird and certainly not like the “popular kids” and their “cool parents” who have allowed their offspring to become caught up in the dark world of video gaming. Experiencing social isolation and even mockery is a bitter pill to swallow for children who want to be accepted by their peers. Young people need to be prepared to face this. Parents can help by introducing them to like-minded peers and their parents. Also, reading and talking about the lives of saintly children (e.g. Saints Tarcisius, Dymphna, Jacinta and Francisco Marto, Joan of Arc, Agnes, Philomena) and how they coped with life’s adversities can be inspirational. Properly presented, these youthful paragons of virtue can serve as role models to our young people who are being engulfed in the self-indulgence and secularism around them. Children need to be taught the meaning of the Fourth Commandment, “Honor thy father and they mother.” They must learn that God expects us to honor our parents by obeying them and that failure to do so could be a mortal sin. Unlike their back-talking peers who have been over stimulated by all sorts of “entertainment” since birth, properly grounded Catholic youth should be taught to recognize that God means what He says and that ignoring, flaunting, and mocking His Laws will lead to severe punishment. Children should be taught to have a “healthy fear” of God and those persons to whom He has given authority. This needs to be restored as an integral part of child-rearing practices, particularly when it comes to curbing youthful concupiscence which is under constant assault by video gaming. Lastly, if parents have been duped into purchasing video games the next step will be more difficult. Keep in mind that evil always portrays itself as attractive, and children and adolescents are, despite their protestations, easily tricked by appearances. So parents need to be prepared for a battle! They need to begin by getting rid of the video games. And they must say “NO” to all protestations and demands to bring them back into the household. Setting strict limits on the use of the family computer and other electronic devises must be put in place. Parents need to help their children find more meaningful and productive ways to spend their time. This may include chores as well as wholesome recreational activities. Most importantly, make sure the Holy Family becomes a permanent part of the home. Place their picture in a central location in which it can be viewed daily, and pray to them for the grace and strength to overcome the Evil One, who is working vigilantly to capture the souls of those most easily fooled by appearances—our children.